New Windows PCs have always been the main attraction at Computex, the annual trade show in Taipei. But notable on the show floor this year is the growing presence of Google's Android OS, which is creeping into more and more tablets, televisions, set-top boxes and even PCs. There's no big company promoting Android here -- Google doesn't attend, and there are no keynotes or press conferences dedicated to it -- so its prevalence can be easily missed. But walking the show floor shows that vendors are increasingly adopting the open-source OS for a wide variety of products, including digital video recorders, media players and USB sticks that turn TVs into connected Android computers. The benefits of Android aren't hard to see: it can be free to use, it's more open than Windows because it's open source, and it's seen by some as the operating system of the moment, according to companies using it at the show. "Everyone is using Android phones and Android pads. This is the mainstream," said Debbie Lai, a sales manager with Honeywld Technology. Her Taiwan-based company plans to launch Android set-top boxes that will bring the OS to TVs, allowing users to surf the Web and use Android apps on their televisions. There's also a small army of Taiwanese and Chinese manufacturers that are turning to Android to build tablets, many of them low-cost products that will be sold in emerging markets like China, India and Brazil. One of them is Onyx Technology, which is making tablets that will be sold for about US$100. The products are on sale now in the Middle East under the brand name Innovel, said Larry Lee, a sales manager. Windows is a "dinosaur" and has been slow to keep up with the times, Lee said. "Android is more flexible and they [Google] listen to their customers," according to Lee. The Android tablets here come in all sizes and configurations, with many from lesser known vendors such as TF Synergy Tech, based in Shenzen, China. It showed 11 Android tablets with quad-core processors and screen sizes from 7 to 10.1 inches. The company also had three Windows 8 tablets on display, but distributors are showing more interest in its Android products, said Jennifer Lei, an overseas business director at the company. Also at the show, Hong-Kong based Minix showed a dual-core thumb-drive PC, called the G4, which was running Android 4.1 on a dual-core ARM processor. Plugged into an HDMI port, it can function as a media hub, PC or smart TV. 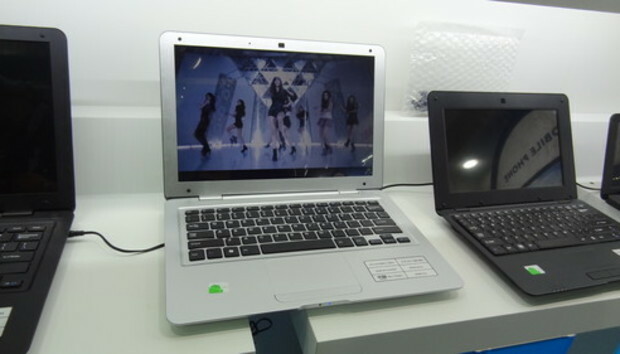 A few Android laptops with ARM chips were on show at the booth of China's Shenzhen Gold-East Electronic, which has been selling them since 2008. They're priced for the low end of the market, at $60 to $100, and designed for "simple operations," said a sales representative for the company. They're sold in India and parts of Europe, and include Wi-Fi support, a 1.3-megapixel camera, and 10.1-inch or 13.3-inch screens. "The price is much lower than a Windows device," the sales rep said. The company says it receives about 30,000 orders for the products every two months. Not only small vendors are turning to Android at the show. Big manufacturers like Asus and Acer have embraced the OS and showed Android computers alongside their Windows offerings this week. Taiwan's Gigabyte Technology, perhaps best known for its PC motherboards, has been making smartphones since 2006. It started out with Microsoft's Windows CE, but like many handset makers it switched to Android. Gigabyte is showing three new Android smartphones at Computex that will launch in Eastern Europe in July. Although there are consumer gadgets at the show, Computex is primarily a business-to-business event, where Taiwan's device and component makers can show off their latest products to global distributors and larger manufacturers. Other Android products here include "rugged" tablets that can withstand dust, scratches, water, and being dropped to the floor. Aaeon, an Asustek company, is selling them mostly for military and industrial purposes. Its ruggedized 10-inch tablet is priced at around $1,000. Shenzhen-based Hampoo is another specialized tablet maker, and hopes to mass market the first glasses-free 3-D Android tablet. The 10-inch screen will automatically switch into a 3-D viewing mode when playing a 3-D video. It will start shipping to distributors in the third quarter and reach end users in some parts of the world by the end of the year. Taiwan's MiTAC International is building an Android smart watch. Called the Ulna, it offers five days of battery life and includes a built-in heart rate monitor. Using Android means it will be able to run exercise and healthcare apps built for the platform. The company hopes it will reach end users in worldwide markets by the first quarter next year.